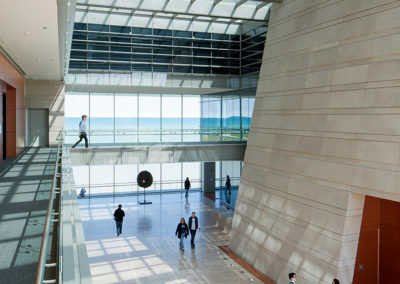 Educational - Ryan Center at Northwestern - Airfloor™ Inc.
Northwestern University’s Patrick G. and Shirley W. Ryan Center for the Musical Arts is an award winner in sustainability, making the Evanston campus “greener” than ever. The Ryan Center has been certified LEED (Leadership in Energy and Environmental Design) Gold for New Construction (v2.2) by the U.S. Green Building Council (USGBC). 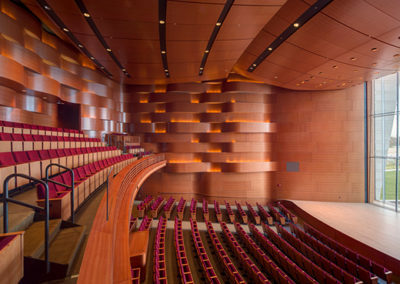 The 400-seat recital hall is the building’s most prominent feature. 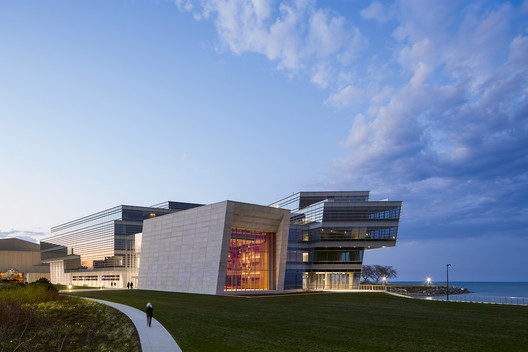 A 40-foot-high double-skin glass wall provides the performers with Lake Michigan and the Chicago skyline as a dramatic backdrop. 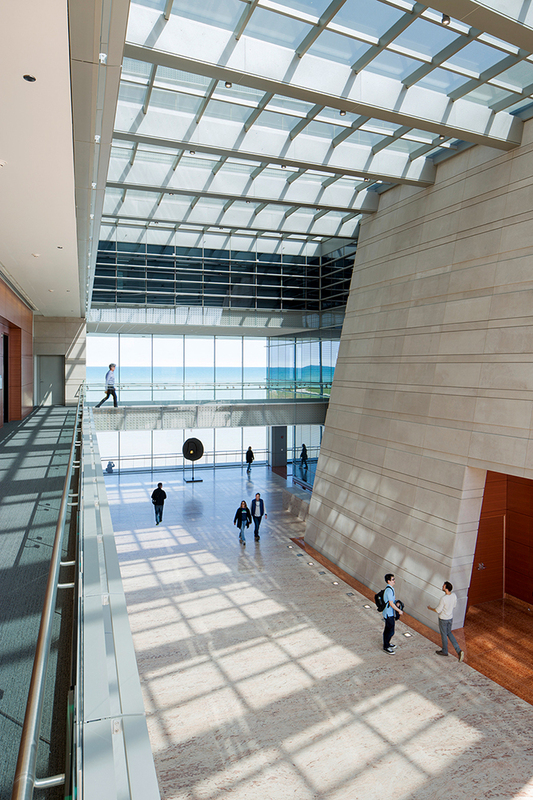 To address acoustical challenges of the monumental glass wall, the inner glass slopes inward, eliminating reverberation. Horizontal woven-wood panels on the other three sides further absorb reflections while lending a feeling of warmth. 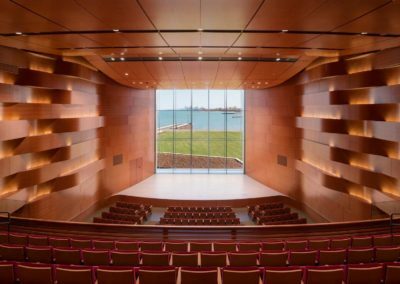 The entire room works in harmony to provide a dramatic visual and acoustical setting for world-class performances of all kinds. Designed by Goettsch Partners, Inc., a Chicago-based architectural firm, the contemporary limestone and glass five-story structure includes three state-of-the-art performance spaces: the 400-seat Mary B. Galvin Recital Hall, the 163-seat black box-style Shirley Welsh Ryan Opera Theater and the 120-seat David and Carol McClintock Choral and Recital Room. 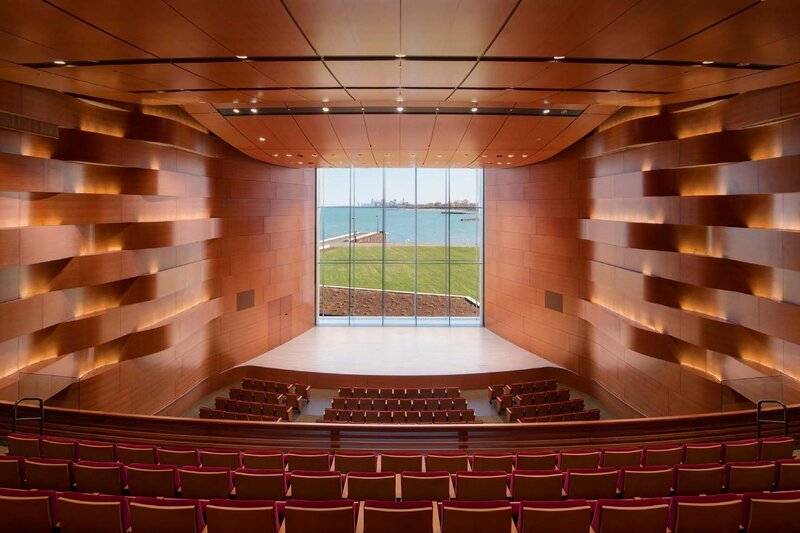 Northwestern University’s goal for the music school was to build a highly sustainable facility, one that engages and invigorates the campus and larger community. The University intends to use the building as an educational tool to encourage and advance the science and knowledge of green building and operating practices. The building was not only designed to be energy and water efficient, using 49 percent less interior water, but also sought to create a healthy environment for occupants that promotes sustainable behavior. Features include the use of low-emitting materials and products; materials with recycled and regional content that are low-emitting, including air testing; and access to daylight and views. The University recognizes the importance of environmental stewardship and incorporates green building design principles in all new construction. Needless to say, we are very proud of obtaining LEED Gold on such a magnificent building. We hope that this project illustrates that sustainable architectural design can be a thing of beauty.